Fish is my favorite protein. I like it because it’s light, it takes on the flavors it’s combined with and it’s quick to cook by any method. Many people like fish, but are hesitant to cook it at home because the cooking time is so short, there is not a lot of room for error. And fish is very easy to overcook…and to under-cook. I love sushi, but sushi is sushi and cooked fish is cooked fish-I’m not wild about the in-between of “rare” fish, except, maybe salmon. 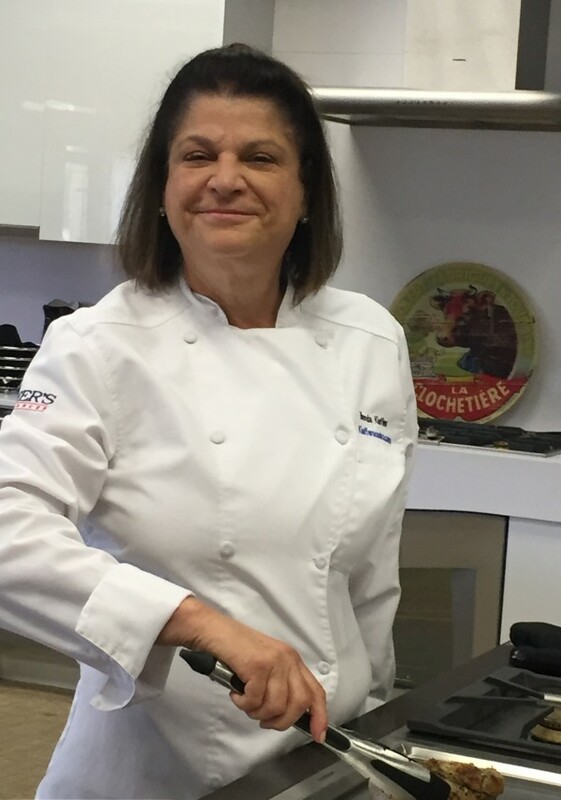 When buying fish, it’s definitely worth seeking out the purveyor that will consistently have the freshest product and that is most likely not the grocery store. Think about it…fish needs to be caught on a boat, brought back to shore, packed in ice, driven or flown to the place of sale and then sold. At least 2-3 days, maybe 4. Then add a central distribution warehouse that the grocery chain is sure to have and you’ve added a day or two. I make the 45 minute drive to a fish monger that I know goes down to the docks daily and sells the fish within 48 hours. Trust me, it’s worth it. Remember, fish should be firm, smell fresh and like the sea, not fishy. I happen to have a vacuum sealer (a worthwhile investment) and when I travel to my excellent fish monger, I buy about $100 worth of fish and vacuum seal it immediately in portion sized packages. I freeze most of it and use the fish according to it’s delicateness-it will last a good 2 months in the freezer without loss of freshness. The lemon sole used in this recipe was frozen and my guests remarked on its’ freshness…I’m not telling! 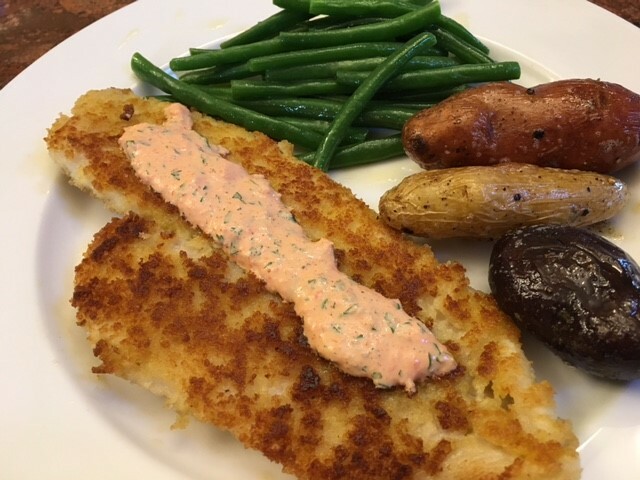 This recipe will convert even a confirmed fish-hater. 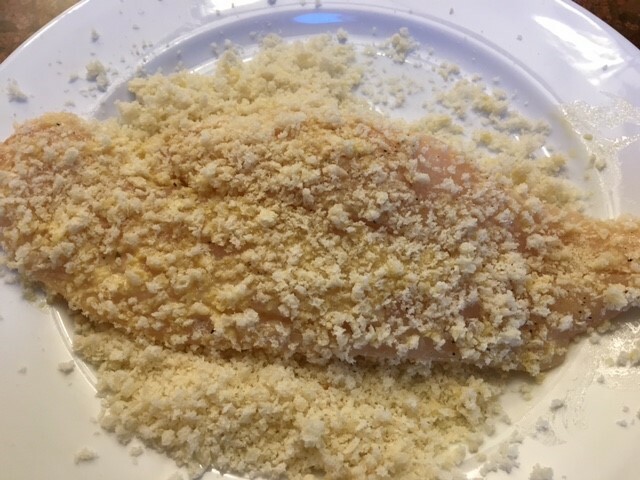 It uses the classic breading method, but with fresh breadcrumbs-I used Pepperidge Farm bread (because I had some) and this dish IS best with better bread-artisan is ideal. It’s easy and fairly foolproof-just be sure not to crowd the fish when sautéing. 1) Put the red pepper in a blender and blend until fairly smooth. 2) Transfer to a small strainer set over a bowl and let the juices drain about 15 minutes. 3) Mix the mayo, chives or cilantro, lemon juice and cayenne in a small bowl. Add ½ cup of the red pepper remaining in the strainer. Mix and season with salt and pepper. Set aside or cover and refrigerate. 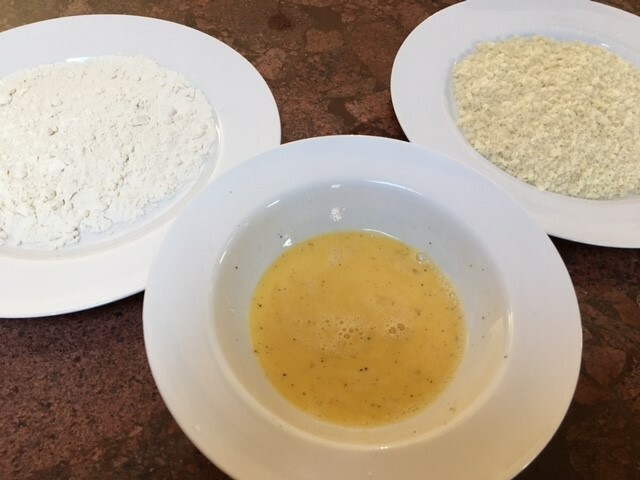 4) On a plate or other flat container, mix the flour and salt and pepper together. 5) In a bowl, whisk the egg and milk together and pour into a flat bowl or container. 6) Put the breadcrumbs on a flat or other flat container. 7) Sprinkle the fish fillets lightly with salt and pepper. 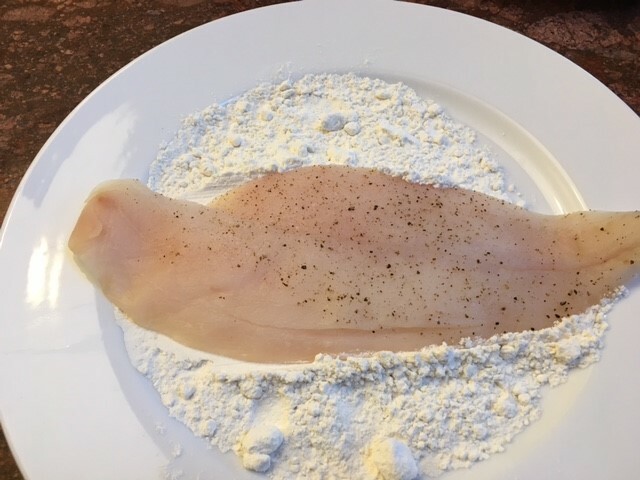 8) Dredge the fillets in flour, shaking off the excess. 9) Slide the fillets through the egg mixture. 10) Place the fillets in the breadcrumbs, patting the crumbs on each side to help them adhere and cover completely. 11) Melt the butter (or butter and oil) in a large heavy skillet (I use cast iron) over medium-high heat. 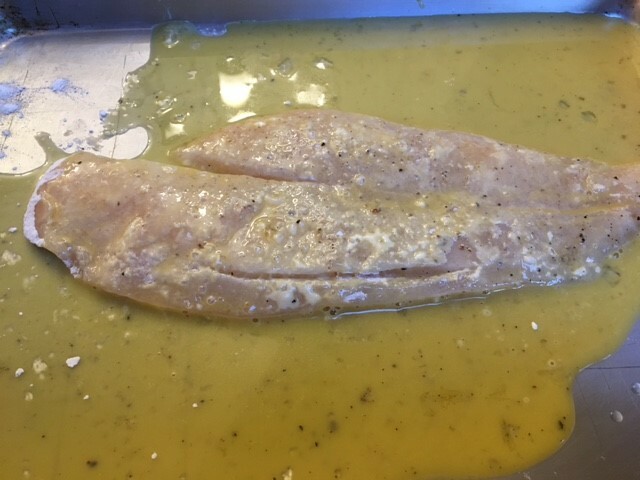 Don’t put all the butter in if you will need to cook the fish in batches. Use half and use the remaining when you add the second batch of fish. 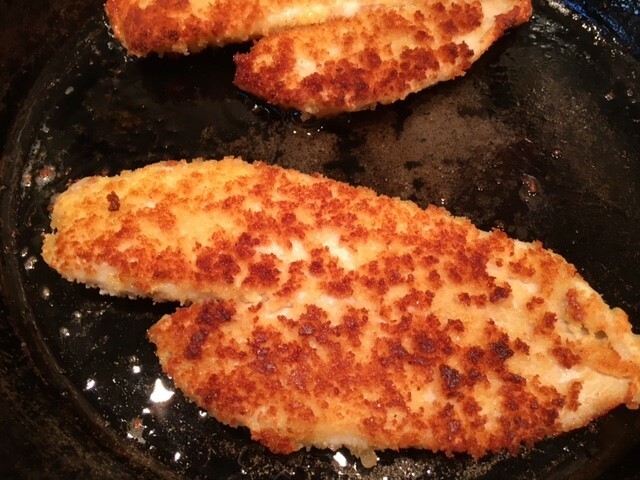 12) Place the fillets (you may need to do this in batches) in the skillet and cook without moving for about 4 minutes until the crust is golden brown-adjust the heat as necessary so the coating does not burn. Turn and cook another 3 minutes. 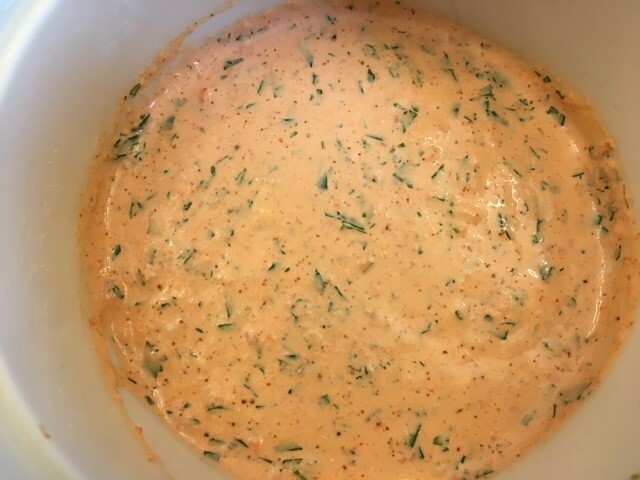 13) Serve immediately with red pepper mayonnaise.